As the holy month of Ramadhan moves towards Hari Raya Aidilfitri, Resorts World Genting is once again doing its part for the community with its annual Majlis Berbuka Puasa with Orang Asli, held with orang asli villagers who live around the foothills of Gunung Ulu Kali on 25 May, 2018 at Kampung Orang Asli Sg Merjuk. 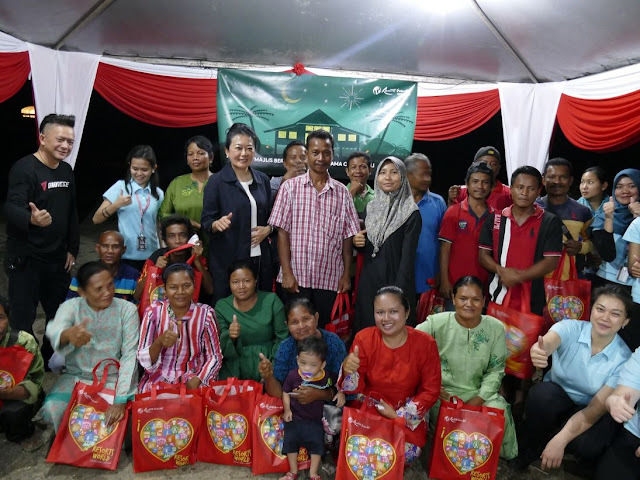 As an event that has been held every Ramadhan for well over a decade, the Majlis Berbuka Puasa with Orang Asli this year brought together some 200 orang asli from Kampung Sungai Merjuk and Kampung Sungai Dua Hulu in Bentong, Pahang. As the representative from Resorts World Genting, Katherine Chew (Vice President of Public Relations and Communications), joined hands with the villagers to break fast as the Maghrib prayer called out over the still of the mountain, before sitting down together for a cheerful and communal iftar meal. After the iftar meal finished, each family from the two villages received a set of sundries as a souvenir from Genting Malaysia Berhad – which included staple foodstuff such as rice and cooking oil, as well as treats such as Milo, Maggi Cup noodles and biscuits – to ensure that the villagers’ Aidilfitri celebrations will be bountiful. All children from the villages also received a customised stationery set, a gift to emphasise the importance of education and play to a new generation of orang asli.